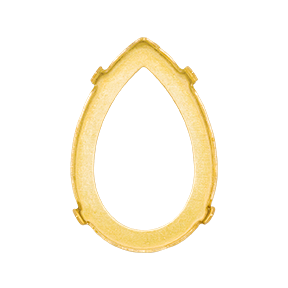 The 4320S Swarovski Pear Fancy Stone Setting is made of brass and designed to work with the Swarovski 4320 Fancy Stone. These settings are designed for use in soldering - with a closed back and unplated. These 8x6mm Unplated No Holes Swarovski Pear Fancy Stone Settings 4320S are available here in a full factory package of 180 pieces. To order Swarovski 4320 Pear Fancy Stones click here. For more information on how to apply the Swarovski 4320/S fancy stone setting by soldering, please review the following section of the Application manual: Soldering, Plating & Stone Setting Section of the Swarovski Application.